Right before hitting up the mighty Tomorrowland grounds with our very own stage, we present you another extremely exceptional night at Vooruit. 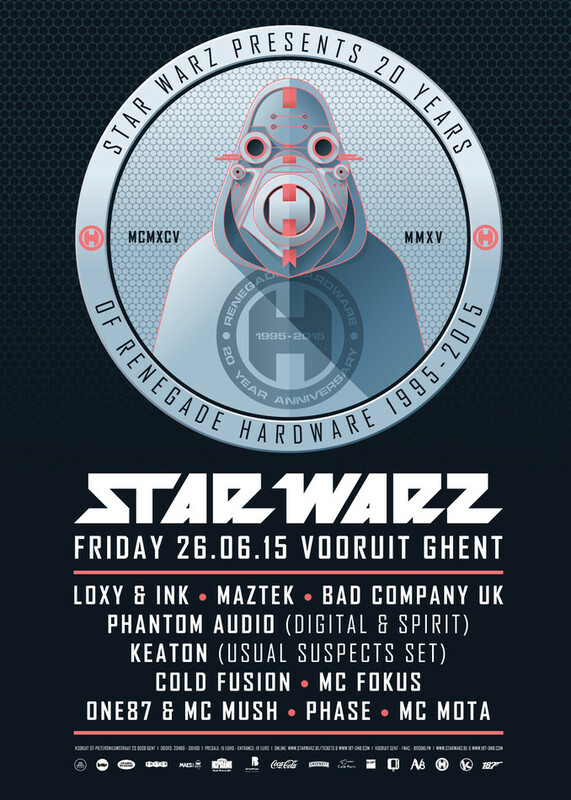 This time, Star Warz has been chosen to be the Belgian event of choice for Renegade Hardware to come and celebrate their 20th anniversary! Creatively born in 1995 Renegade Hardware has without question cemented itself as one of the most pioneering Drum ‘n’ Bass labels in the world. Over the past 20 years of its establishment, Hardware has shaped and shifted the Drum ‘n’ Bass scene in more ways than one: steadily setting standards, pushing boundaries and associating itself with a darker more cutting edge Drum ‘n’ Bass sound. With an exceptional ability to spot and nurture raw talent, the label has proved to be a breeding ground and unique platform for producers to develop into established artists. Just a glance at the back catalogue throws out a multitude of household names, from the original legends such as Future Forces, Usual Suspects, Future Cut, Konflict and of course the resident label stalwarts Ink & Loxy to the new skool leaders of Pendulum, Noisia, Friction, Spor and Chase & Status. All these names and many more have been etched not only into Hardware wax, but more importantly in to the minds of the legions of fans all over the world. Through Hardware’s evolution one element has remained constant as an ever present theme - the future. Releasing the most forward thinking music is the foundation on which the label is built on and what it will always stand for, not bending to trends or following fashions. Influential, not influenced. Future beats, for future people. 2015 is a huge year for Renegade Hardware, as they enter their 20th year in the business, a rare milestone in Drum ‘n’ Bass. To celebrate this landmark in their history they will be hosting some very special anniversary events all over the world. They started in London & Brixton and have now chosen Star Warz as the only place to stop by in Belgium. We have a very impressive line-up to present you. Each and every dj. has been influential and defining to the Drum ‘n’ Bass scene from way back then to right now. We start off with Loxy & Ink who have both caused serious havoc throughout Drum ‘n’ Bass’ long history. Loxy worked with labels as varied as Good Looking Records, Exit Records, Metalheadz, Renegade Hardware, Razors Edge, Digital Soundboy, Shogun Audio and Architecture Recordings. He started his own Cylon Recordings in the early 2000‘s with Dylan and went on to launch a joint imprint with Keaton (of the Usual Suspects) called X-tinction Agenda. His most recent imprint, Cx:Digital, has been a labor of love on his own. Ink became associated with three names that changed the landscape of British electronic music early in his career: Basement Records, slightly later Metalheadz and Renegade Hardware. He went on to form his own imprint, Architecture Recordings and now has four long-players under his belt. These two are awesome on their own but when they team up they are even more outstanding. So we are sure they will blow you away! A newer addition to the Renegade stalwart is Maztek. Over the last 2 years Maztek’s tracks have become a staple in an ever-expanding diverse selection of DJ sets. Known for his skillfully crafted dance-floor orientated Drum ‘n’ Bass, Maztek’s productions wreak havoc not only across club land, but also across the charts every time they are released. After several collaborations on Renegade, he released his first solo EP on the label in 2013 and the ‘M Theory’ tracks exploded in the charts. A first LP is now in the making! Back to the base with Bad Company UK who have been active since the late nineties and produced 4 legendary albums on their own BC Recordings, next to numerous dub-plates and collaborations with names as Ed Rush, Optical, DJ Trace and many others. Down to 2 members from the original four but still down to the Drum ‘n’ Bass floor like before. Another formation of heavyweights is Phantom Audio. A collaboration between Digital and Spirit which started with joint productions for Metalheadz and Razors Edge. Those led to the Phantom Audio label which arose from the duo's desire to have their own base. The debut release, ‘Phantom Force’, became one of the most played tracks of the turn of the century and you can still hear it being dropped in sets from the likes of Andy C, Friction, Goldie and many more now. It was closely followed by another anthem with 'Remote Control' for Timeless. Phantom Audio continued its success over the years with a number of key releases and major remix work, none more so than Shy FX & T. Powers massive hit 'Shake Your Body'. There are not many artists that have created a single track that defines an era, but in Drum ‘n’ Bass, Keaton—as part of The Usual Suspects—did just that with ‘Killa Bees’, the epochal single released on Renegade Hardware in 1999. Epitomizing the dark, intensely nervy sound of the late 90s, the single was in near-constant rotation in every corner of the Drum ‘n’ Bass scene and Keaton found himself in the enviable position of having entered the game on the top floor. Many years on, Keaton has released over 100 tracks on various high profile labels. Just like Loxy & Ink, Cold Fusion was a resident at the legendary Renegade Hardware events in The End in London during the nineties. He has been taking the Hardware sound direct to its dedicated legions of fans ever since. Not only as a dj. and producer, but also as the head of A&R and full label manager at Renegade Hardware. He’s already left an indelible mark on the scene and will continue to push forward the best in cutting edge and forward thinking Drum ‘n’ Bass for many more years to come. First of all, at Star Warz! Renegade have selected only the best from their roster for their 20th birthday and we hope you are as impressed with this line-up as we are! To top it all off they will be joined by MC Fokus from the UK who is fairly new on the scene but already tipped as one of the future bright stars and MC Mota from Rampage in Belgium who has amongst others been nominated ‘Best MC’ in the UK Drum ‘n’ Bass Awards. Off course, also promoter and resident One87 will be there, teaming up with MC Mush in good Star Warz tradition. With releases on 31 Records and Good Looking we can’t really call Phase a young talent but he will represent the local colors with style! All Hardware supporters, both new and old are duly invited to come to the Vooruit and represent to the fullest, to celebrate the sound of Renegade Hardware. We can't wait to see you there!